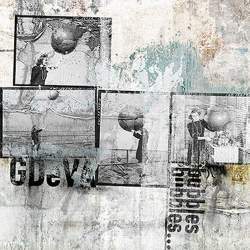 St Petersburg three-piece GDeVA have only been together for a short time, and unfortunately that becomes rather obvious on their debut album Bubbles, Bubbles… which offers five mostly very long improvisations of guitar, bass and drums. While the bass guitar is doing some melodically intricate rhythm work, and the drummer does his best to fill the gaps with sensitive playing, the guitarist seems to be playing a long one hour solo that is really not going anywhere. Psychedelic jam sessions can be very stimulating, as their Welsh label peers Sendelica have shown on their latest album, but GDeVA, who took double as much recording time (well, two days, still not a lot), just can’t seem to capture my attention with their debut. The different songs or sections are sounding just too much the same, and calling one track Impr. In Studio feels a bit like a joke when the whole album has this improvised flair. They are trippy as hell, and the rhythm section is redeeming itself, but GDeVA need to learn that even a good impro needs a certain amount of discipline, if they want to reach a wider audience. Bubbles, Bubbles… is just too meandering for my taste.